Here is a sneak preview of my first pattern to be published through my sister’s company, Villa Rosa Designs – for a new line of her fabulous pattern cards! Should be going to press at the end of the week and will be available on VillaRosaDesigns.com soon. I’ll be doing accessories patterns to add to her Rose Cards quilt patterns. My first set of patterns will be the Jane series, and the first pattern is Amanda Jane – a seven-pocket work apron. I am thrilled with the finished product, both the pattern and the apron! 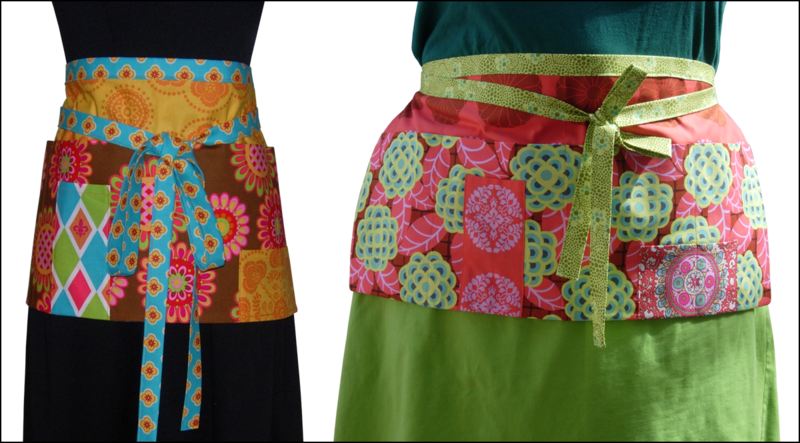 The apron has several layers of fabric to it; front, back and the large front pockets, plus two additional pockets in the front. The long, long waistband and tie is a 4″ piece folded in the half, then folded again, for 4 layers of fabric. It is extremely easy to make and yet the finished product has a really solid, quality feel to it with all those layers of fabric. As with all my patterns, there will be a link to additional Pics, Tricks and Tutorial. The apron fits all sizes from 6 to 3X. In this pic, the apron on the left is on a size 6 dress form and the apron on the right is on a size 3X human. Can’t wait for you all to see the finished cards!